As a superhero in a major city, Spider-Man sees a lot of apartment fires, and puts his strength, agility and Spider-Sense to good use rescuing anyone who might be trapped inside the burning building. But the real heroes are the men and women who do the same thing every day, without the benefit of a radioactive spider-bite. They may not be able to scale walls without a ladder, or break down a door without an axe, but firefighters have truly earned the label "superhero." 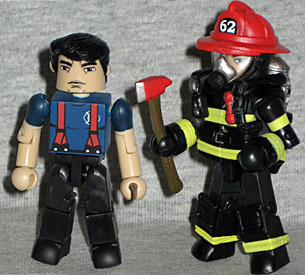 This set is sold in the new style of Minimate packaging, which debuted with the specialty market version of Series 41. It features a single large window in the center, showing both figures at once. This is the third time the packaging has changed, and it's actually a rather sharp design. 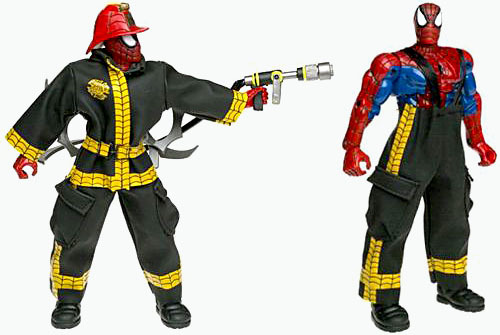 Spider-Man makes a snazzy fireman. The red and blue of his costume make a very nice contrast against the black and yellow of the fireman's uniform. 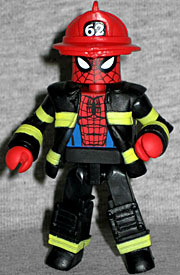 This actually isn't the first time Spidey has donned the firefighter's clothes, but the less said of that the better. His jacket (from the the MAX Fire Chief set) hangs open so you can see his Spidey-suit, and he's wearing a red helmet with the number 62 on the front - a reference to the year of his creation. Since the "plain" fire fighter helmets have hair on them, Spidey's uses the same mold as the "respirator" helmet, just without the clear facemask glued in place. That's pretty darn clever! And it works well, too. As before, you can strip Max down to a more casual look: he's still wearing black pants, but he trades his bulky jacket for a blue shirt with red suspenders (the set includes an extra pair of feet and bare arms to complete the look). The face is identical to the previous release, but he does get new hair. Well, not "new," but "not the same as the last one." It's a black wave, rather than a brown slick-back. [That's "A Pimp Named Slickback," to you! --ed] Alternately, you can leave his jacket on, and give him the respirator gear. Unexpectedly for an exclusive, the set includes a lot of accessories. In addition to the feet, arms, hair, alternate helmet and air tank, there are also two axes, two yellow flashlights with black straps, and a webline for Spidey. Honestly, it was already a bit surprising that we got the "civilian" stuff for Chief Max, so the rest of this is just gravy. 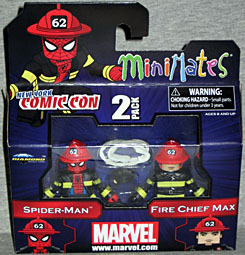 To further set these figures apart from the Minimates MAX firemen, the back of their jackets have "NYCC 2011" in big yellow letters. There's no more quintessentially "New York" superhero than Spider-Man. Hell, there may be no more quintessentially New York character, period. So making him a New York Comic Con exclusive makes a lot of sense. 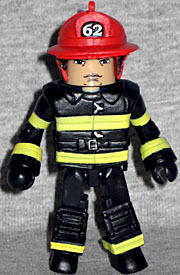 Turning him into a fireman is a clever way to create something that hasn't been done before, reusing nothing but existing molds and introducing the "Minimates MAX" idea to new fans, all at once. This entry was posted in Art Asylum, MMMR and tagged Minimates, Spider-Man. Bookmark the permalink.